Get to know the great city of Austin! Check out Barton Springs, the Stevie Ray Vaughan Statue, Auditorium Shores, Zilker Park, South Congress, our Historic Capitol Building and more! At each stop your expert tour guide will share the history and significance of each landmark. Be sure to bring your camera and sense of adventure as you explore our great city! Tour includes hotel pick-up and drop-off in our open-aired shuttle. This is a family friendly tour, groups of all ages welcome. *Infants and children must follow all legal safety regulations for traveling in a motorized vehicle. Begin with pick-up and drop-off right at your hotel or short term rental! Staying outside of downtown? You can begin and end the tour at the Austin Visitor's Center. 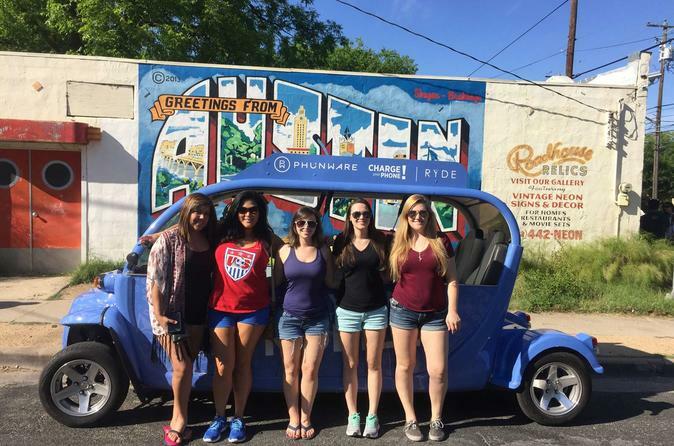 After being picked up in our 100% electric, open-aired cart, you will head straight to South Congress where you will find some great restaurants, desert spots and some of the best boutique shopping Austin has to offer. While there, stop for some great photo opportunities in front of some fun Austin themed murals. Then head west to check out Austin's famous Zilker Park and cruise through Restaurant Row on Barton Springs. Begin to head east to pass by the Stevie Ray Vaughan Statue and the Willie Nelson Statue. After a quick cruise by the Capitol Building, roll through the famous 6th Street and see why Austin is the Live Music Capitol of the World. Check out the 1950's houses turned bars on the up and coming, local hotspot, Rainey Street. Finishing off your tour learning some incredible history and facts at the Texas State Cemetery before being dropped of at your Hotel, Short Term Rental or the Austin Visitor's Center.